Always forget the usb flash drive attached to the work PC or friend's house? Always forget a disc in the dvd reader/burner? No problem... Free USB Guard will alert you in case a flash drive (or another external drive) is attached or a disc is present in the dvd reader during the shutdown or log off process! 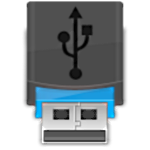 Note about external HDD: the software can also detect them only if they are plugged after the software has been started. Otherwise you can select them manually in the menu "monitor the presence of these drives".